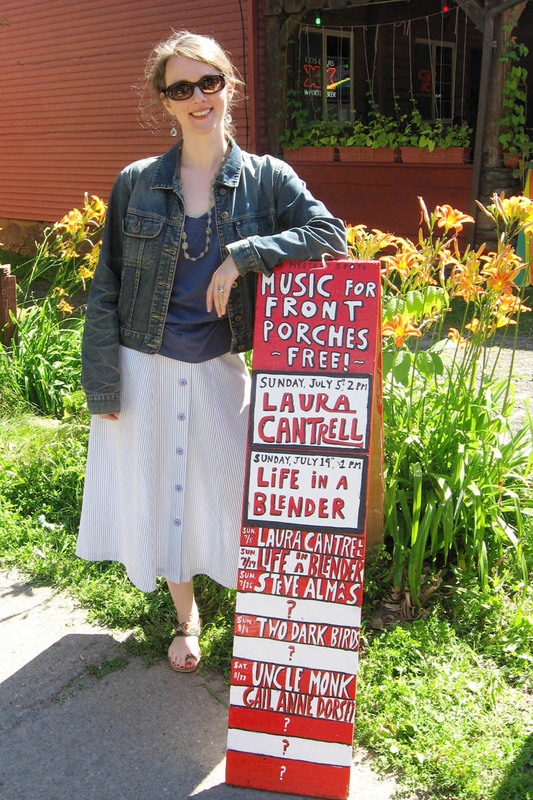 We kicked off our free Music for Front Porches series on the afternoon of July 5, 2009 with a musical performance by the dazzling and delightful singer/songwriter Laura Cantrell.Folks came from near and far and a great time was had by all. Here are a few snaps from the day. Enjoy! 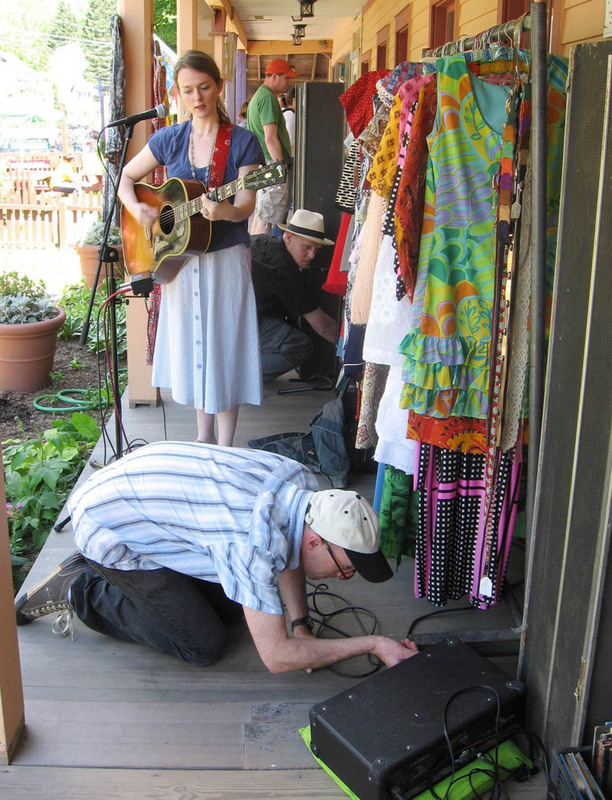 Mark Lerner helps set up the gear which he so kindly loaned us for the show while Laura sound-checks. 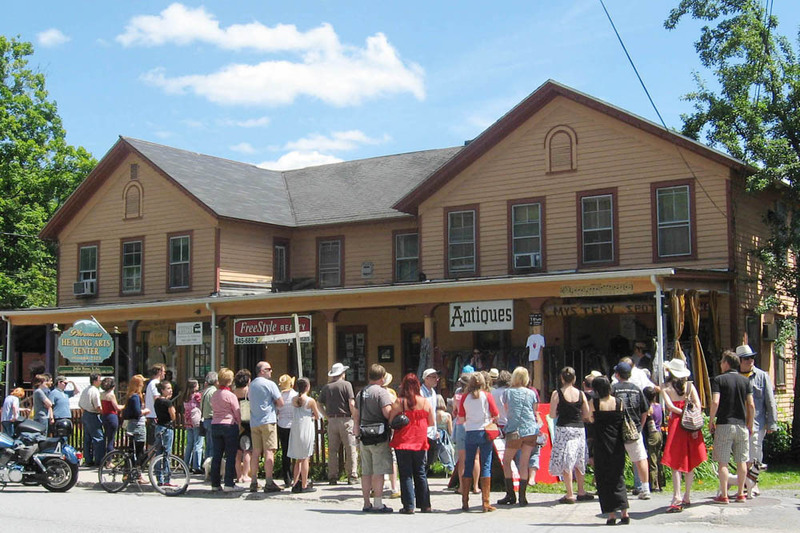 Great turn-out on Main Street on a lovely Sunday afternoon in July. Laura and Jeremy collect the fee in a currency we all understand. Forget the gold standard, here at the Mystery Spot Vinyl is King. 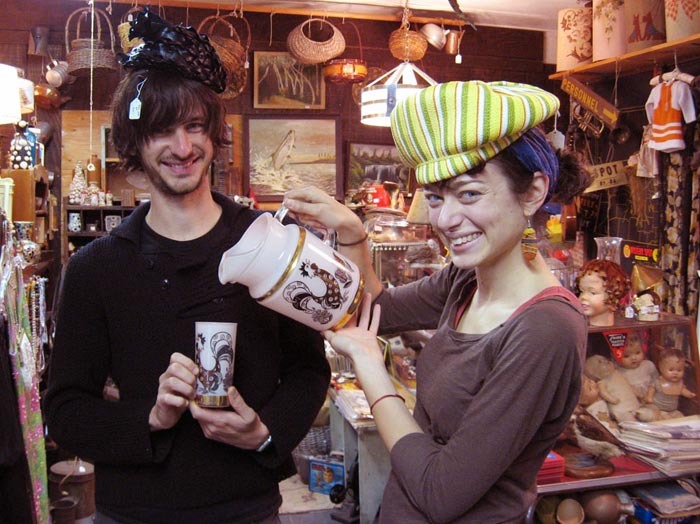 We have several years of photos of our customers and their favorite Mystery Spot vintage finds which we’ve been shamefully remiss in not posting sooner. 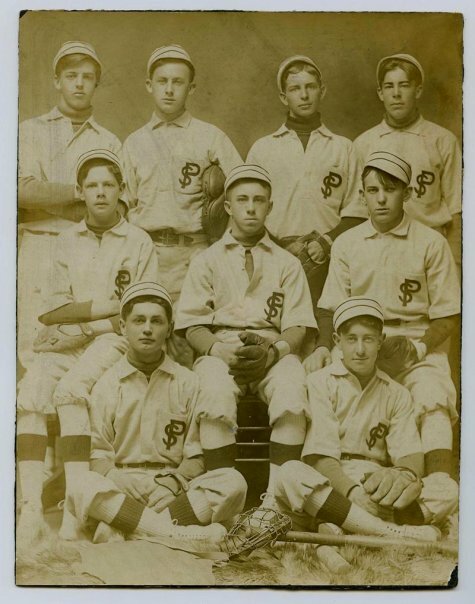 Keep checking back as we sort through the archives! 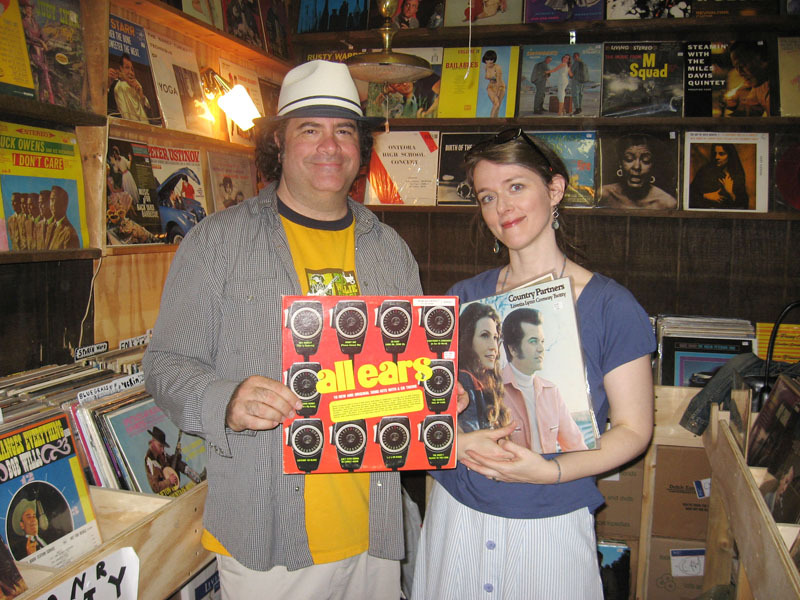 Animal lovers Mary Gormley and Justin Hawkins stop by to admire our assortment of vintage cats and dogs. Mary’s Friends of Snuffy organization has been lovingly supporting our four-legged friends for several years now. 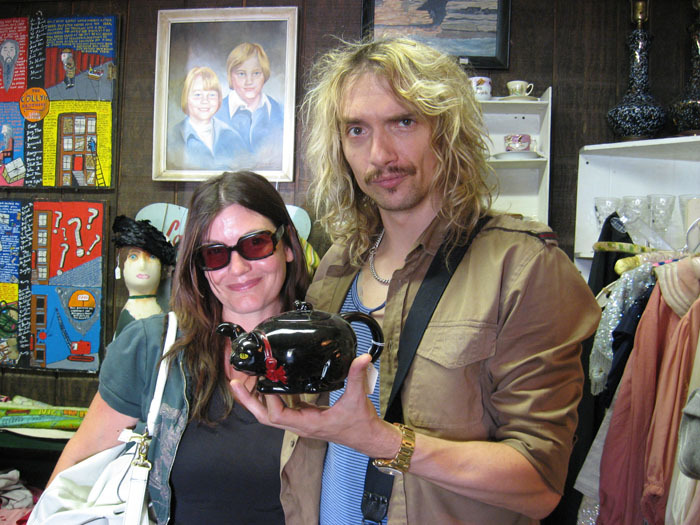 Londoner Justin – the former lead singer of The Darkness - has an obsession with cats. Holding a favorite vintage 1940s ceramic black cat teapot, he let us in on a secret: “My collection of porcelain and brass cats is enormous!” (Yes, he has some wooden cats as well. He also has two real live breathing purring cats, Cully and Smellbear). 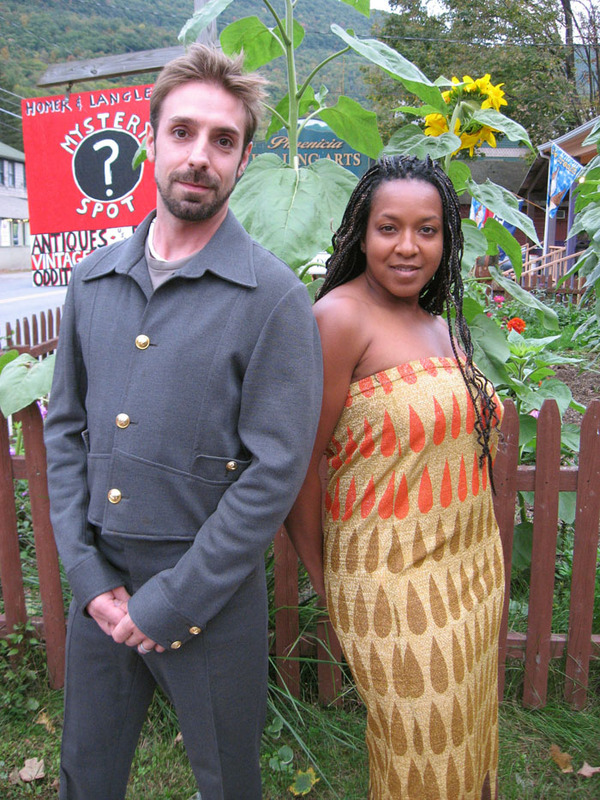 Brooklyn musicians Neil Nash-Coulon and Rozz Nash-Coulon look utterly divine in their latest Mystery Spot buys. Neil scored with one of our favorite ensembles in the shop – an original 1960s Valentino suit with cropped Eisenhower-style jacket ($125.) which came from the collection of a former fit model who tells us Mr. Valentino fit the suit to him personally. Rozz brilliantly wears this vintage Sixties Nelly DeGrab metallic teardrop maxi skirt ($44.) 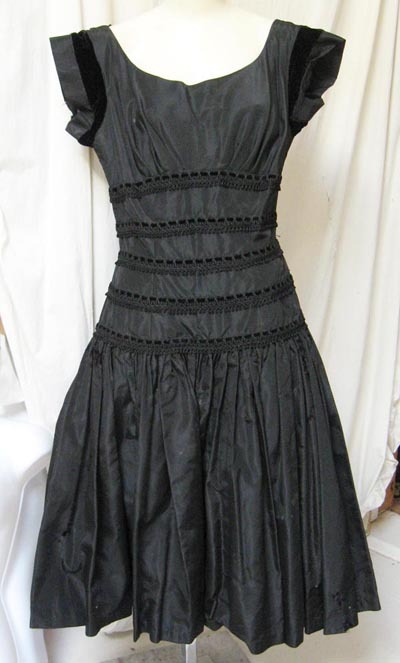 as a strapless dress - love! Fred Flare’s Keith Carollo has a flair for flowers. 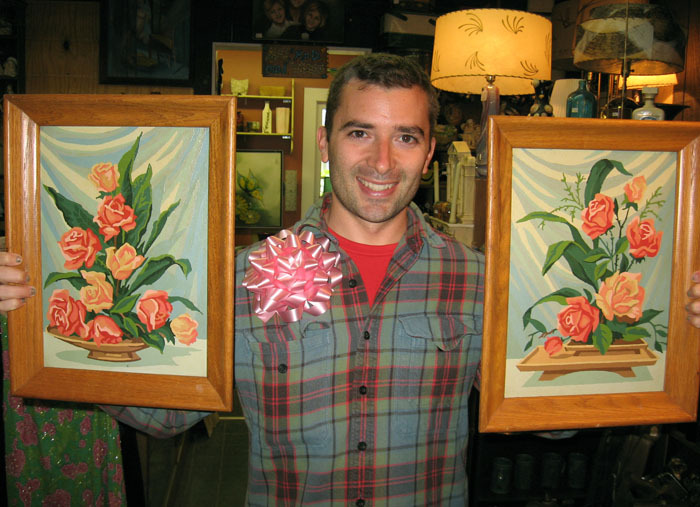 He took home a matched pair of vintage framed Paint-By-Number paintings of roses ($32. each). We love his ribbon flower corsage! More PBN fans! 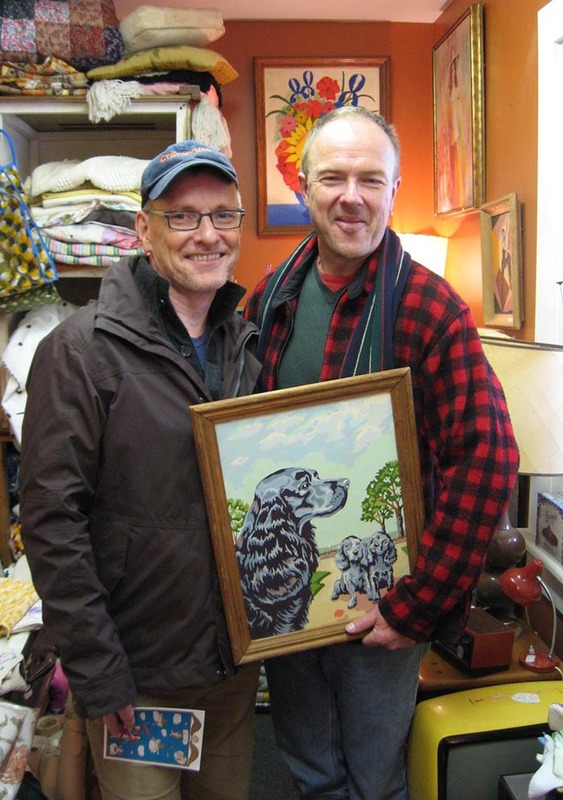 Our old friends John Tucker and Carl Molert stopped in to say hey and couldn’t resist this adorable vintage Paint-By-Numbers painting of a sweet black spaniel and her puppies. Maybe it’s because they have two beautiful spaniels of their own? Mystery Spot shout-out to Buster and Lucy! 1950’s New Look white felt hat ($32. ), vintage clip-on bowtie ($4. ), NOS Sixties red, white and blue striped sweater ($20. ), vintage corduroy men’s hat ($20.) and Words and Visions by Ilse Bing, as happily procured and displayed by fashion designer Jay Ott, Laura Sjogren, and Callie Lansley. 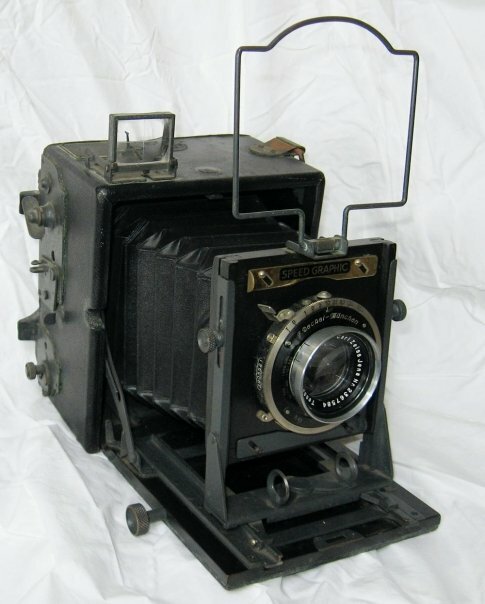 We’re a big fan of photographica, so we’re always bringing in old cameras and especially interesting old photographs we come across from estates. Here are a few recent finds. 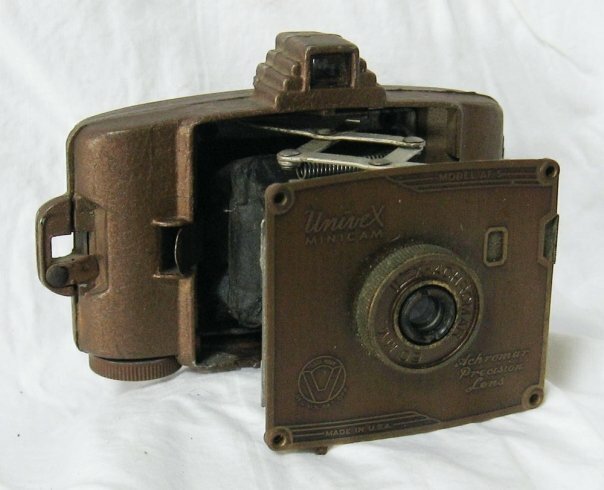 1930's Art Deco tiny all metal body Univex Minicam - only 2 inches x 3 inches! Film Friends at the Mystery Spot! The Woodstock Film Festival always brings a fun group of folks into town, including many of our fellow filmmaker friends. We love it when October comes around, because we know we’ll be seeing our old pals and getting a look at their great new work. 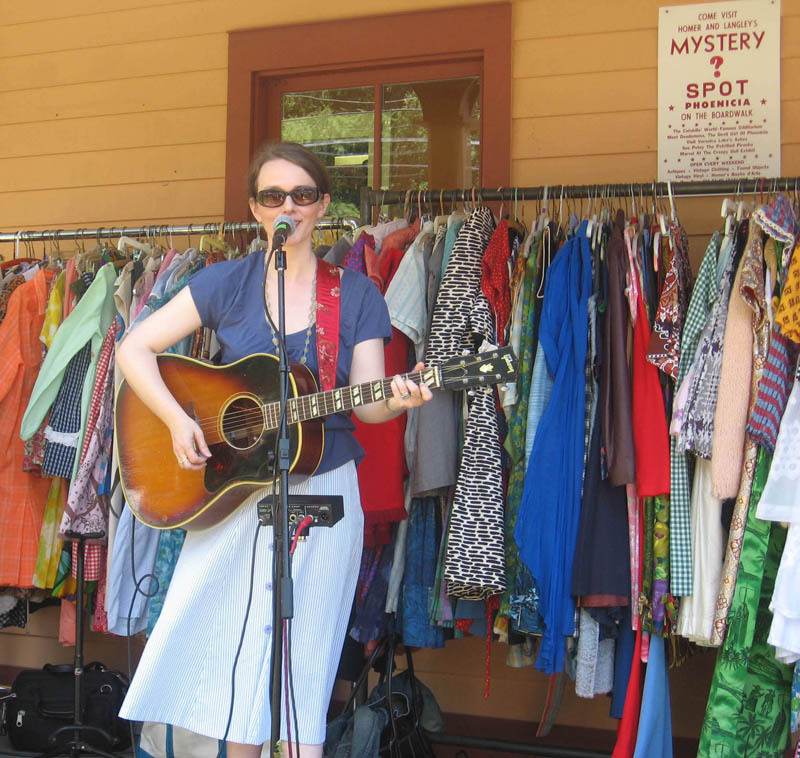 We met animators Lisa LaBracio and Aaron Hughes a few years ago, and it’s now become an annual tradition for them to make a pilgrimage to the Mystery Spot part of their WFF itinerary. Lisa looks absolutely smashing, my dear, in this Sixties Miss Dior lemon and lime striped Carnaby Street style hat ($45.) and pours Aaron a fresh glass of an imaginary (but delicious) beverage from this Fifties pink and gold frosted glass rooster lemonade set ($55. pitcher and six glasses) which, naturally, went home with her. We first met Lisa and Aaron through this fellow… Academy Award-winning animator and all-around swell guy Bill Plympton, who we’ve known for many a moon. (In fact were happy to introduce the folks at the WFF to him, beginning a long and fruitful professional relationship that continues to this day). 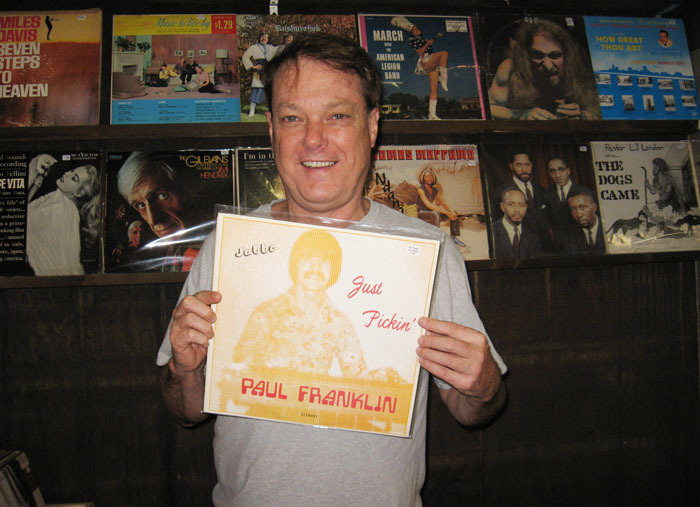 Bill picked up a copy of Paul Franklin Just Pickin’ ($22.) for his Official Mystery Spot Portrait. Lovely Ava is a vision in pink. 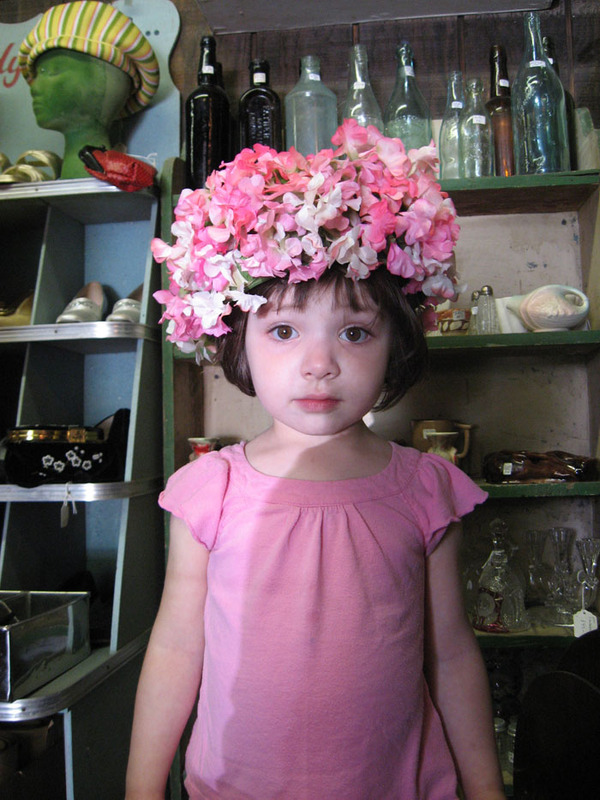 She loved playing dress-up so much with this 1950s pink flower hat ($15. ), mom and dad let her take it home. 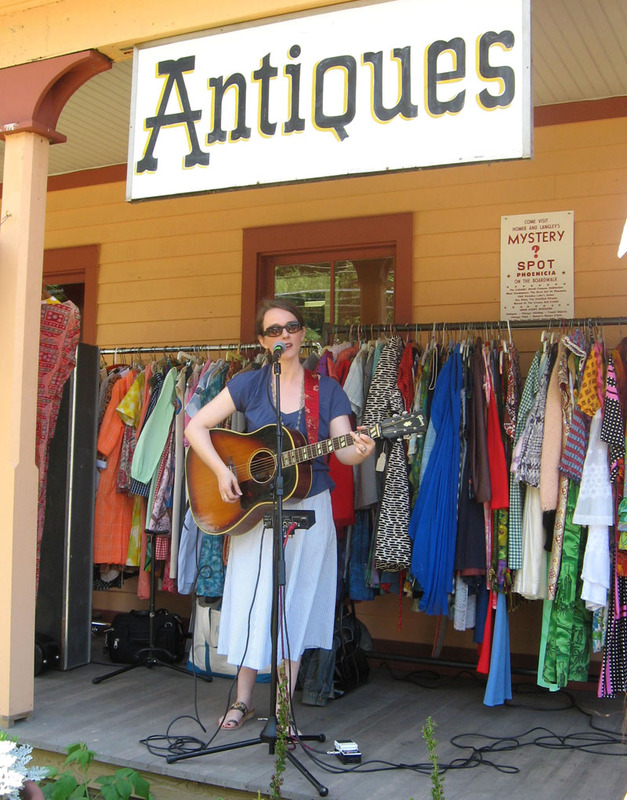 Wedding cake artist Linda Laestadius stopped into the Mystery Spot to see if she could find a special something to wear to a vintage-themed party her company Sweet Nothings was catering. 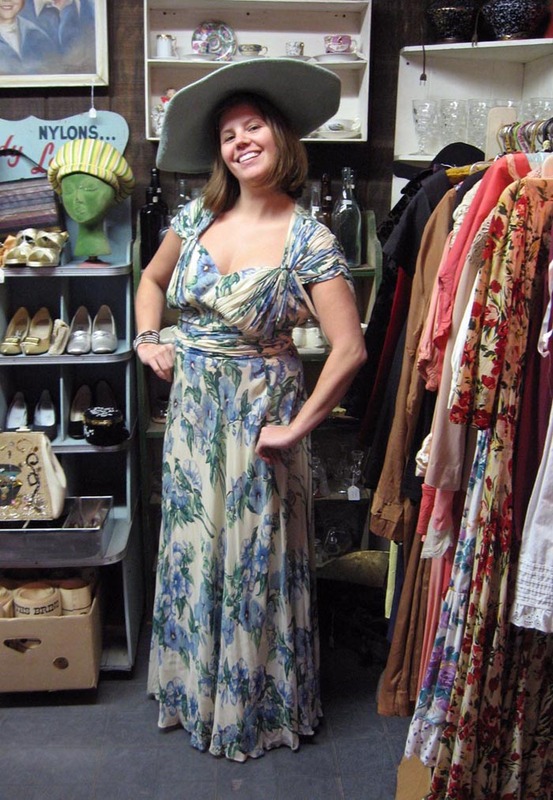 We’d just gotten in this stunning vintage 1930’s long floral tea gown ($60. ), and it was love at first sight. The large-brimmed baby blue felt hat ($35.) completed the ensemble. Artist Z.B. 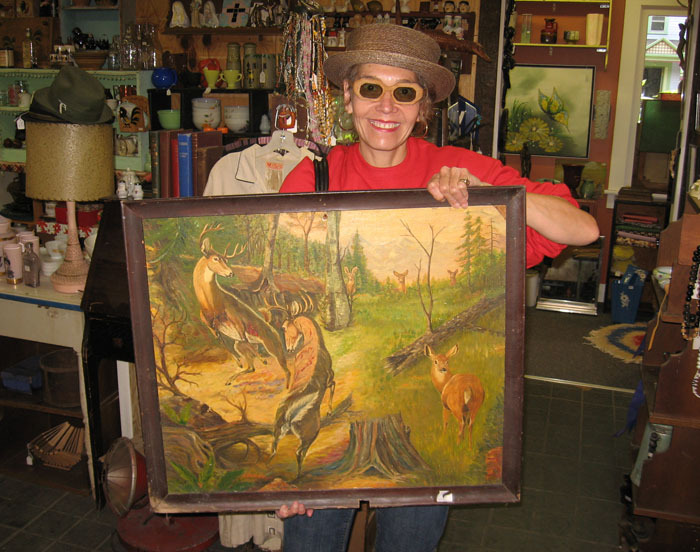 Alpert has had her eye on this signed 1940’s painting of a deer fight for a while now. We did a little hondling, and $125. later, it was hers’! 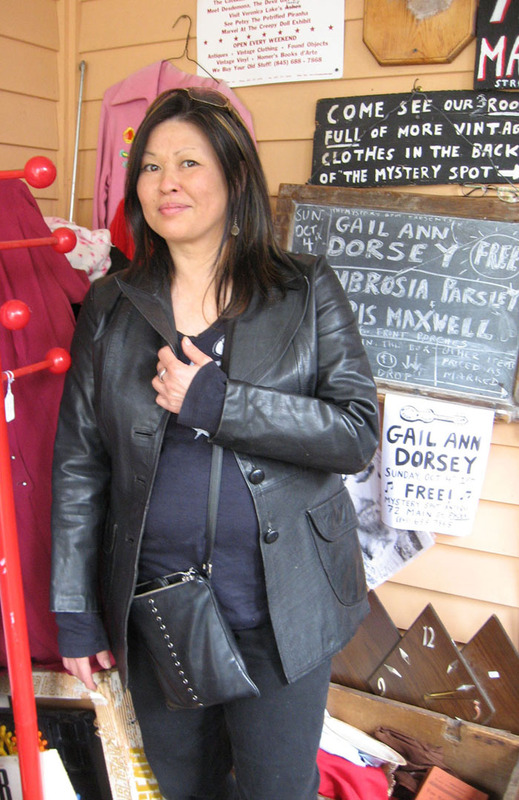 Singer/musician Sally Be came all the way up from the city to see Gail Ann Dorsey perform on our porch, and while she was here she couldn’t resist picking up this killer vintage black leather jacket ($55.). Some recent visitors and friends…..
Nobody lights up a room like our old pal Jahn (X-Sessive) Xavier Bonfiglio. We’ve known X since we photographed his band the Nitecaps when he was a teenager (and we weren’t that much older, to tell the truth!). X started out at the tender age of sixteen playing bass for Richard Hell and the Voidoids and has continued to rock ever since. Check out his current bands Sugartime and Jahn Xavier & The Bowerytones.X serenades the Spot on this 1920’s signed mother-of-pearl inset antique Edelklang mandolin. Gorgeous instrument, right? 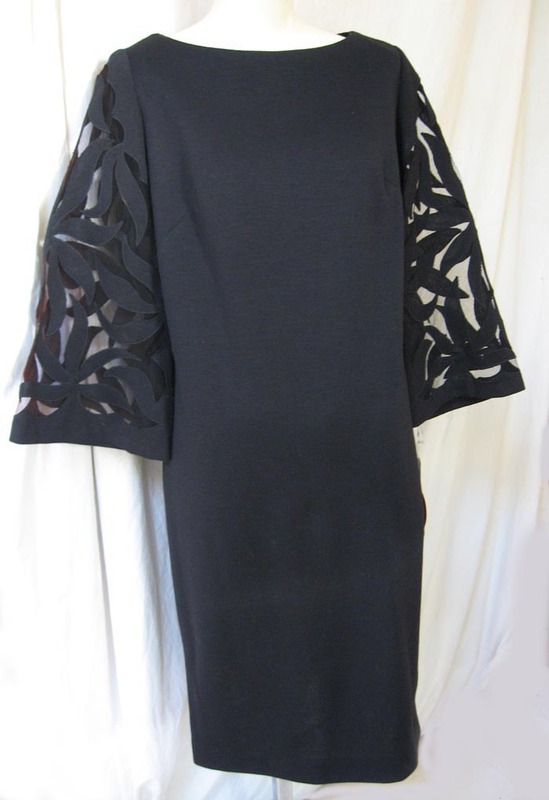 Wait until you see the back – it only gets better! 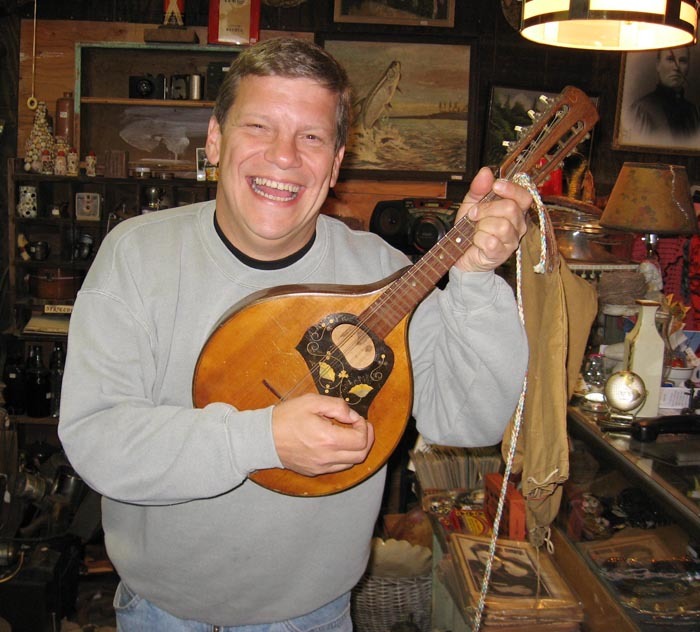 The mandolin was originally owned by a WWI soldier who gave it to an upstate New York schoolgirl back in the 1960’s. 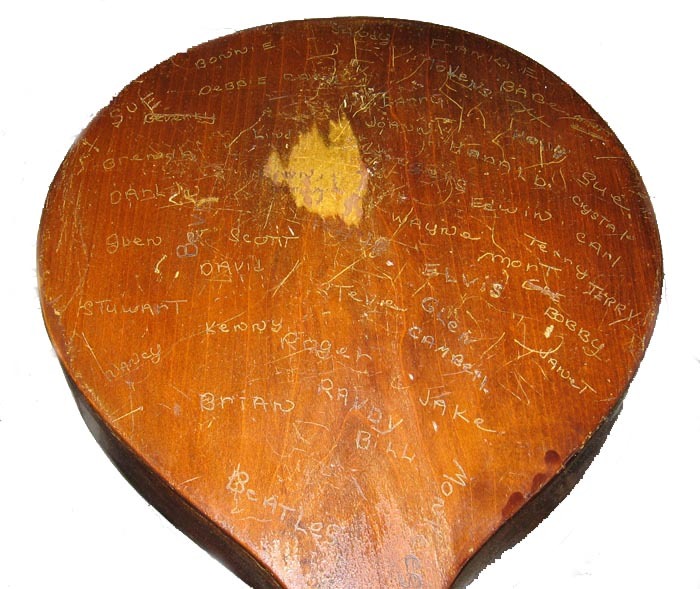 She and her friends proceeded to carve their names (as well as names of their friends, the Beatles, Elvis and the Monkees) into the back. 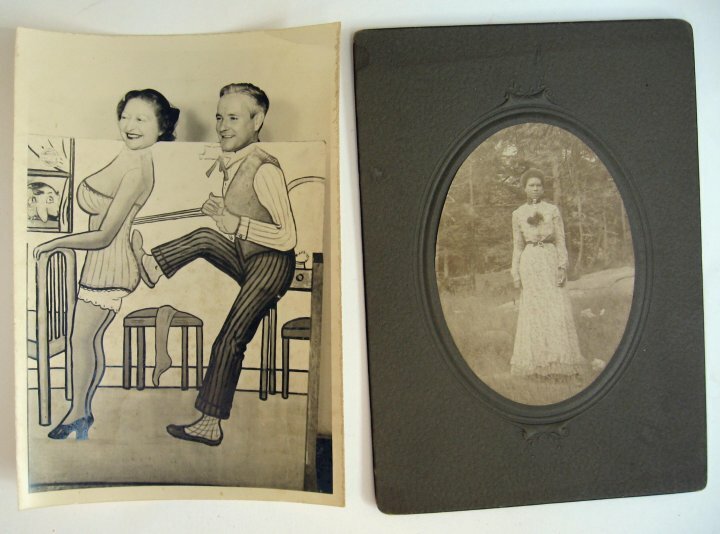 Rock ‘n roll folk art. 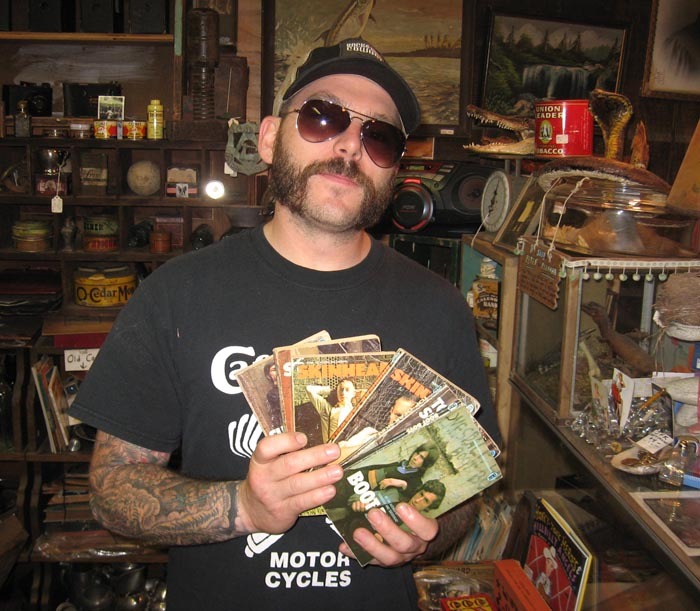 A.D. was pretty darn stoked to find a set of original 1970’s skinhead books by Richard Allen ($40. 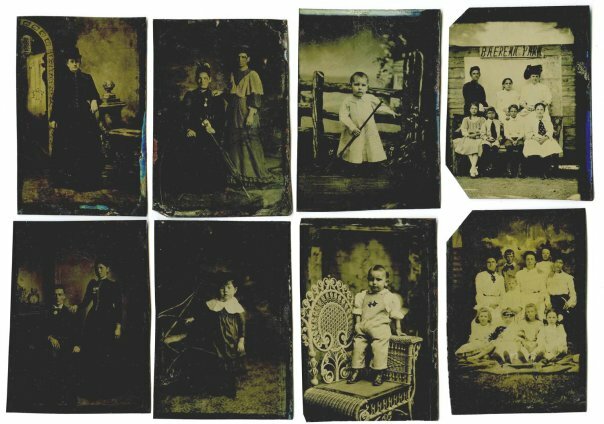 for the set of 6). When not working at Vespa Soho, A.D. sings and plays guitar with Van Cougar. 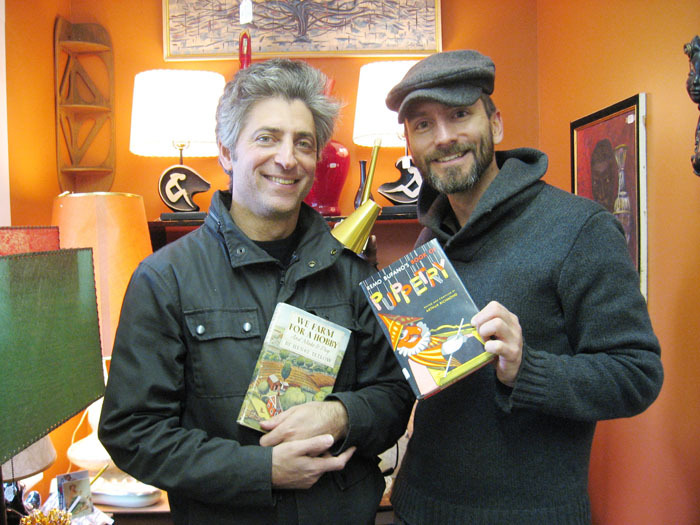 We love Marc Wolf and Craig Thompson! Marc is an Obie award-winning actor/playwright (Another American: Asking and Telling) and horticulturist who picked out We Farm for a Hobby to add to his library. Craig is a long-time friend and supporter of the Spot and the most incredible baker we know. People travel for miles to pick up the delicious baked concoctions he creates for Shandaken Bake. 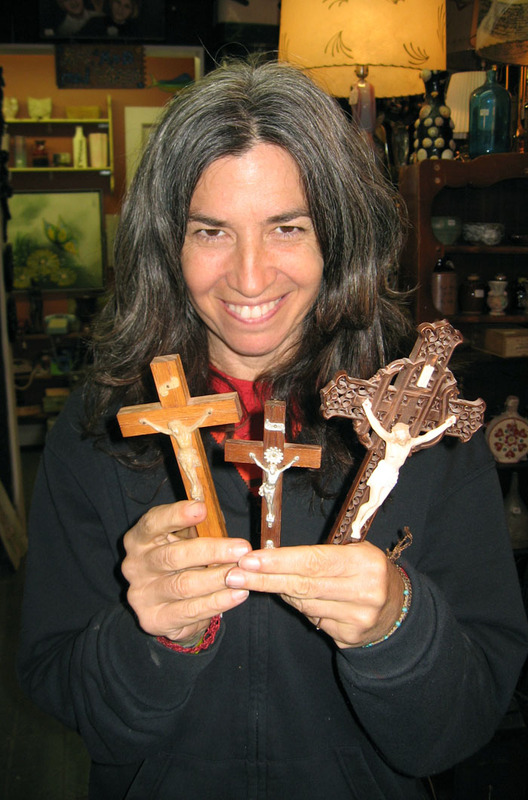 He zeroed in on The Book of Puppetry (did we mention he also makes puppet theaters? ), and they both decided a nifty 1960’s reading lamp would round out the reading nook. 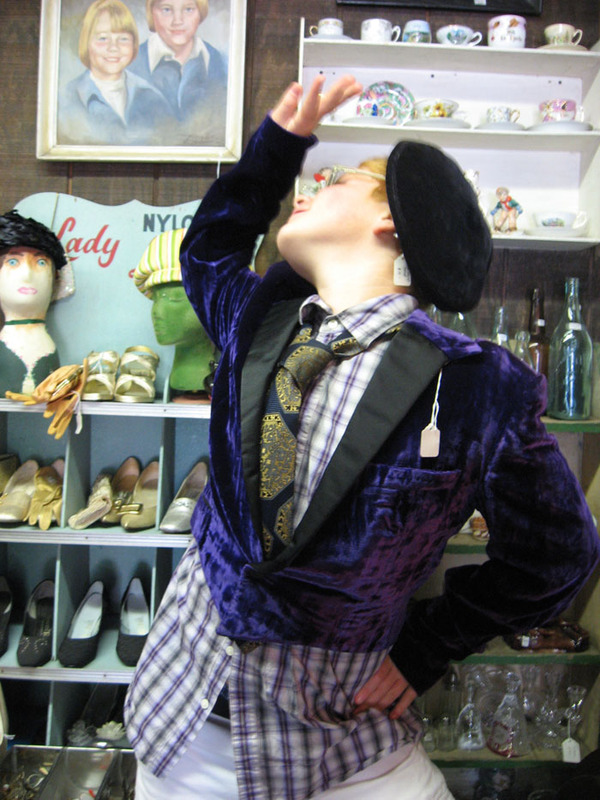 Jackson, age thirteen, channels his inner hippie toreador in this vintage 1950’s crushed purple velvet bolero jacket ($125), elegant tie ($4. ), black beret ($12.). and vintage granny glasses ($20. ).